Today I had the opportunity to send some information along regarding Nodaway County's sixteenth sheriff, Joseph M. Cooper. Sheriff Cooper was born in Symmes,Ohio, Lawrence County, 1837-1843 and later migrated to Nodaway County. On September 20, 1860 he wed Annie M. Woodard in Maryville. Just a year after his marriage, in 1861, Joseph Cooper was mustered into the Union Army, at the age of 18, and served loyally until being released from his first tour of duty. He would reenlist two more times, finally being discharged in 1865, at the age of 23. He was described as being 5'10, blue eyes, dark hair, dark complexion, and that he was a farmer at the time of his enlistment. Mr. Cooper farmed on land northeast of Maryville, along side the 102 River, where he had a brick ford (kiln), and approximately 125 acres, growing corn and wheat. He was considered a good farmer and quite amiable. It is unknown what the disposition of his marriage to Annie Woodard was, but is is know that Mr. Cooper remarried some years later, in Alaska. Mr. Cooper ran for sheriff, on the Democratic ticket, in 1876 and won. He assumed the duties of the office, after perfecting his bond around December 1, 1876, and was sworn in. In 1877 after only six months in office, he joined in business with a Mr. Jacob Wills, and they opened the Favorite Restaurant on the south side of the Maryville square. It was said to offer good meals at any hour, with clams available on request most of the time. In January of 1877, Sheriff and Mrs. Cooper welcomed a son into the family, but the child died in August of that same year. It is unknown what other children, if any, came of the marriage. After his term of office concluded, Mr. Cooper left Nodaway County for British Columbia, later making his way to Alaska. There is a place on the Kenai Lake called Cooper's Landing, where it is believed former-Sheriff Cooper found the gold mine he was seeking in 1884. Other Nodaway Countians, members of the Alexander family, were also living and mining in Alaska and sent information home. 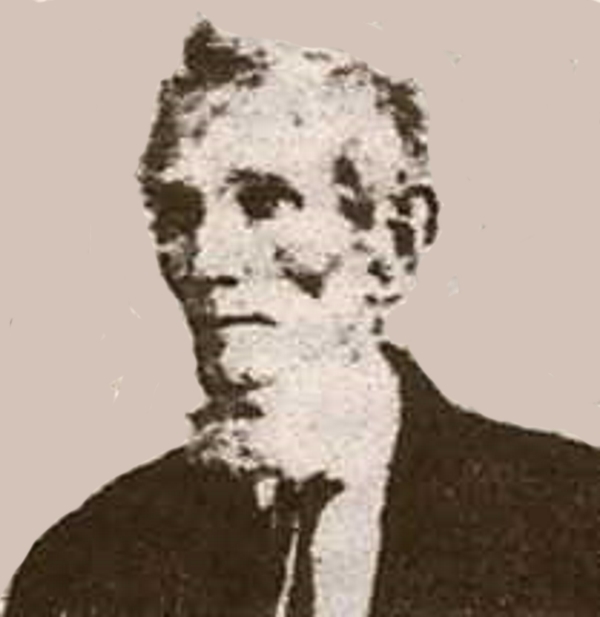 Joseph M. Cooper was later reported as having died in Alaska in October of 1897. Word of his death didn't reach Nodaway County until May of 1898. However, in May of 1898, another notice was posted in a newspaper that the death of Joseph Cooper was a mistake and that he was alive and well and living at Cook's Inlet, Alaska. Our good sheriff was reported dead more than once. In 1882, it was printed that he was "shot in the head" and killed by a "desperado" and his gang while they were trying to rob Mr. Cooper and his brother in Wenatche, Washington. Mr. Cooper appears to have had more lives than a cat. He may yet be living. The photo above is believed to be Joseph M. Cooper, but the photo is undated. It was found on Ancestry. Mr. Cooper had a short but distinguished career as sheriff, solving two significant robbery cases in Nodaway County, one that occurred at the mill in Arkoe, and another in the town of Hopkins. I am still trying to form an accurate picture of Sheriff Cooper's life and travels from the man pieces which are coming to light. I hope to have a clearer picture when the biographies are completed.